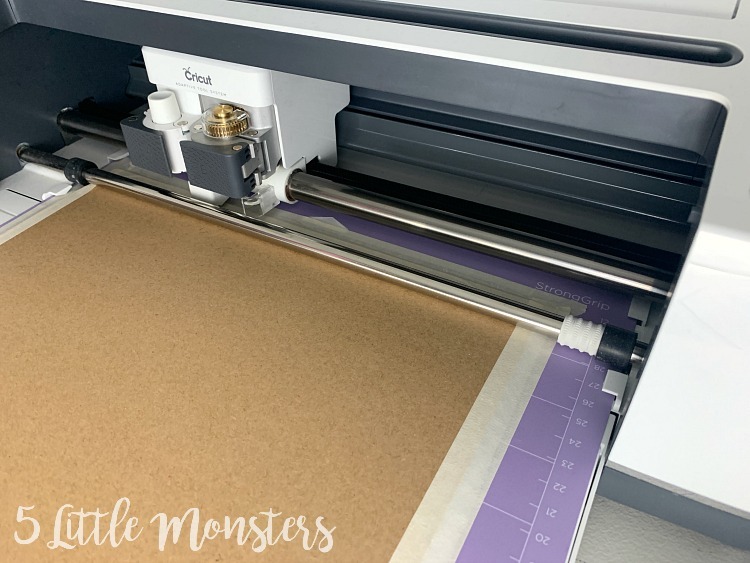 Last week I posted all about the Cricut Knife Blade, what it is, what you can cut with it, and tips and tricks for using it successfully. Today I am sharing a project I made with it. I have had a craft room/office space for quite a while but I haven't ever done anything to decorate it. I have been wanting to make some stuff to hang on the wall above my desk, I have made a few things that I have set aside to eventually hang up but I still wanted some more. 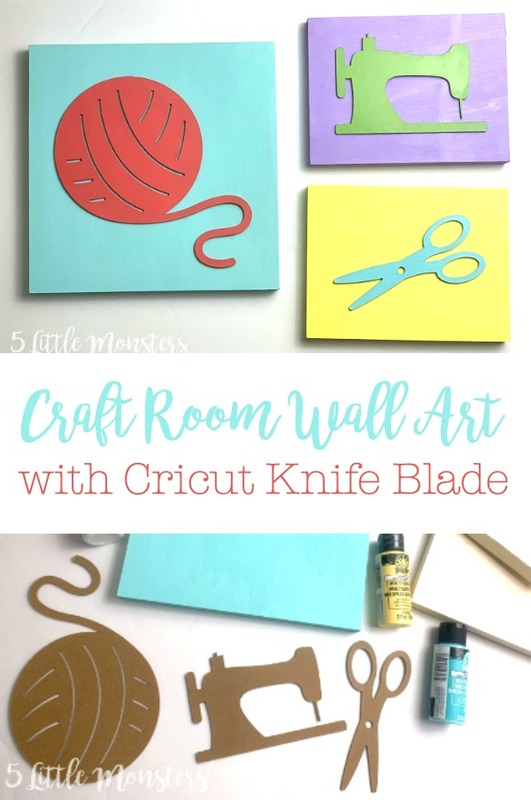 I wanted something that would add a little color to the room so I decided make some really simple craft themed wall art using my knife blade. 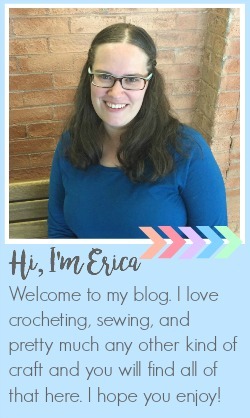 I chose a couple of crafty items that I thought would be easily recognized shapes, as well as things I use on a regular basis. 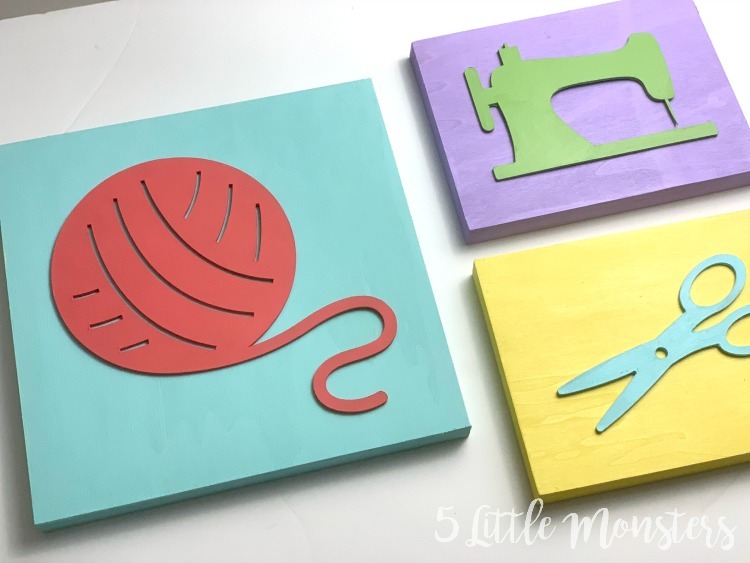 Then I cut out those shapes and put them on some wooden canvases. I could have done a similar thing with vinyl or paper cut out and put on the wood, but I wanted to add a little dimension to the project. So, instead of using something flat like vinyl I chose to cut the shapes out of chipboard. That way when they were attached to the wood they stood out a little. 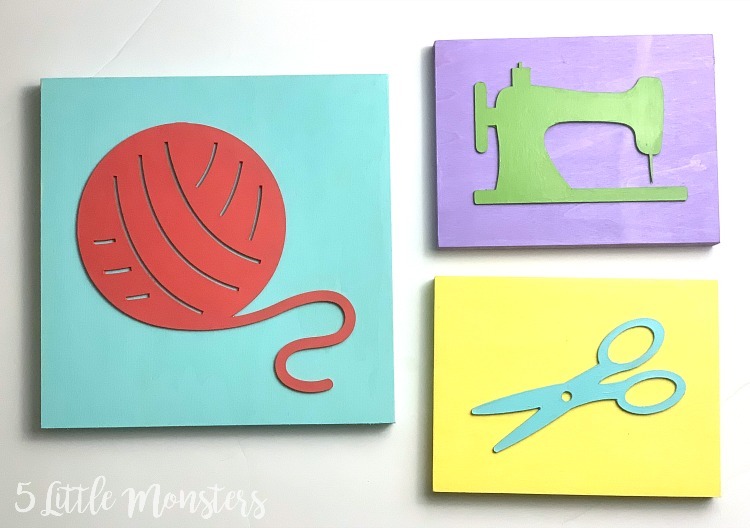 I painted the wood canvases and the chipboard shapes in a variety of colors and glued them to together. Open the Craft Room Art Design Space File. Tape the chipboard onto the mat. Push the white star wheels all the way to the left. Cut each of the designs from chipboard. I found that my designs were done in about 13-14 passes rather than the 20 it said it would take. 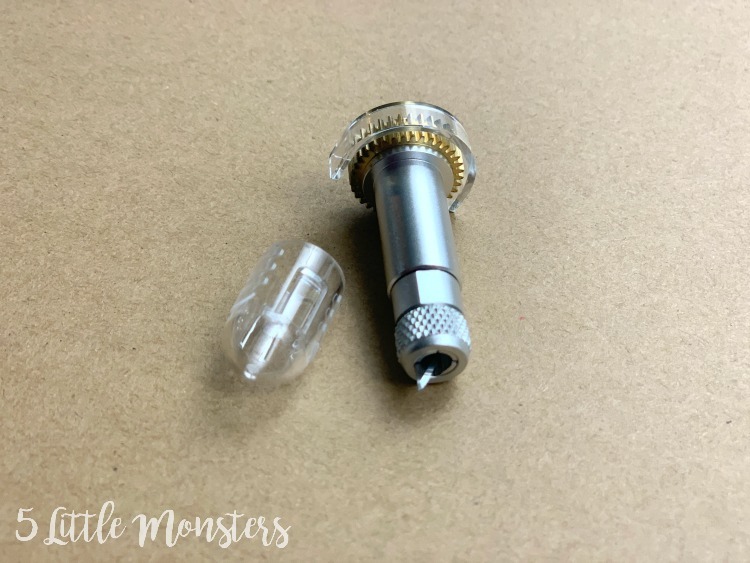 It you take out your chipboard and find that there are small sections that didn't quite cut through and you took it out a little early you can use the true control knife to cut those small pieces. I had this happen on the inside of my scissors but was able to fix it easily. 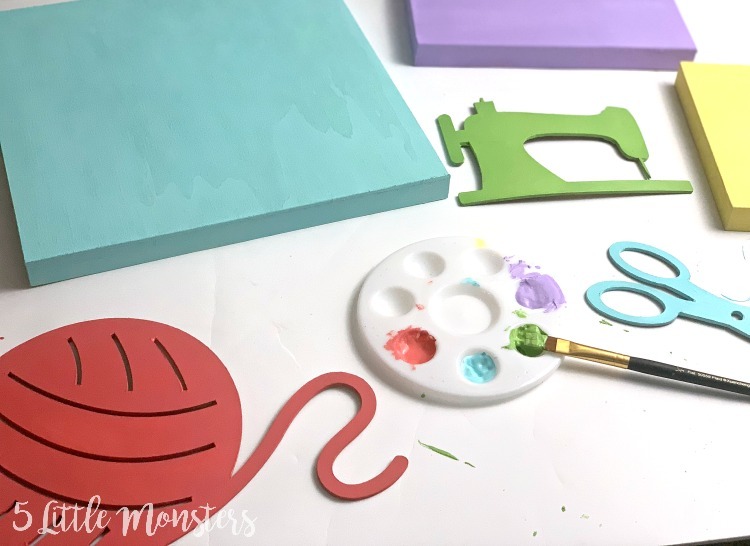 Paint the wood canvases in whatever colors you want and set them aside to dry. 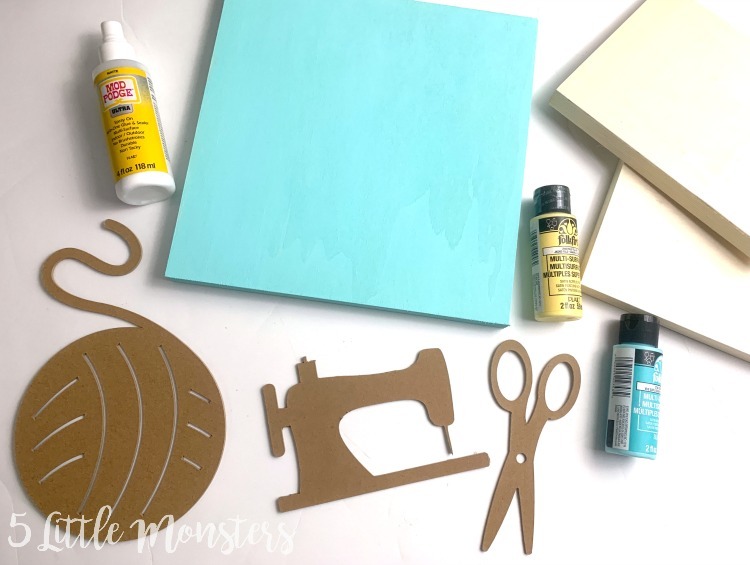 Seal your chipboard with Mod Podge or other sealer, I used Mod Podge Ultra so I could just spray the chipboard and let it dry. Then paint in desired colors. Make sure you get the edges too. It may take a couple of coats to cover. Last you will glue the chipboard pieces to the wood. I used hot glue and that worked but there are probably better glues to use. Then they are ready to hang on the wall. I like to use the velcro command strips to hang these types of plaques on the wall.